When you set out to draw, where do you go? Do you have a destination in mind already? Do you wander to find inspiration? Do you prefer to go to famous places - well known for their scenery? A short time ago, I brought a large batch of my Italy drawings into my class for a critique (I'm a college professor of illustration). It was a good role reversal for everyone. I covered a long wall with drawings. Like most critique recipients, I was anxious. But, I encouraged honesty from my students and they delivered. We talked about the good, the bad, and the ugly before them. What was most interesting to me, was the clear lack of enthusiasm for drawings that I had made of the most famous sites (like, "Piazza Plebiscito")*. These beautiful, historic places were of less interest to viewers, not more! Using the same skills, materials and time, I was unable to generate enthusiasm in my viewers. They admired the drawings of famous things less. Why? One student stated in a matter of fact way, "because they are two kinds of drawings, altogether". She explained that one kind of drawing was of what I, the artist had found to be interesting. The other kind were drawings of subjects that others have found interesting. She was right. I had decided differently why to draw these subjects. "Several days later Murray asked me about a tourist attraction known as the most photographed barn in America. We drove 22 miles into the country around Farmington. There were meadows and apple orchards. White fences trailed through the rolling fields. Soon the sign started appearing. THE MOST PHOTOGRAPHED BARN IN AMERICA. We counted five signs before we reached the site. There were 40 cars and a tour bus in the makeshift lot. We walked along a cowpath to the slightly elevated spot set aside for viewing and photographing. All the people had cameras; some had tripods, telephoto lenses, filter kits. A man in a booth sold postcards and slides -- pictures of the barn taken from the elevated spot. We stood near a grove of trees and watched the photographers. Murray maintained a prolonged silence, occasionally scrawling some notes in a little book. "What was the barn like before it was photographed?" he said. "What did it look like, how was it different from the other barns, how was it similar to other barns?" 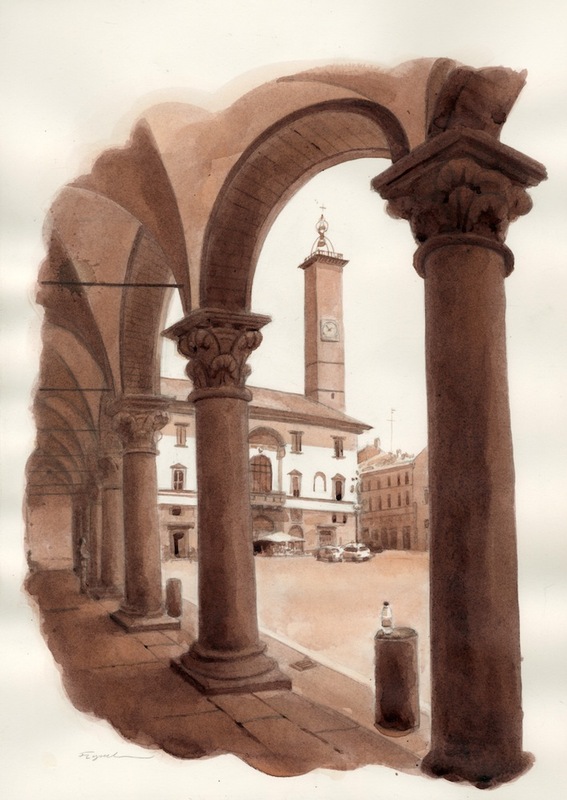 "
When we draw famous places, we are consciously or unconsciously burdened by others' perceptions of the place. We see the place in a shared way. We look through our own eyes at the subject, but also through the eyes of all the other viewers of this subject. Many of us are also looking through the eyes of other artists who have drawn this subject, or subjects like it. In other words, we may compromise our enthusiasms to serve the expected - a pre-pictured image. In the case of my work, the drawings of famous sites were serving as a "substitute image" of the thing - a symbol - a postcard. I made decisions of how to show the subjects clearly and recognizably and perhaps, too typically. They looked like what drawings of that place usually look like. 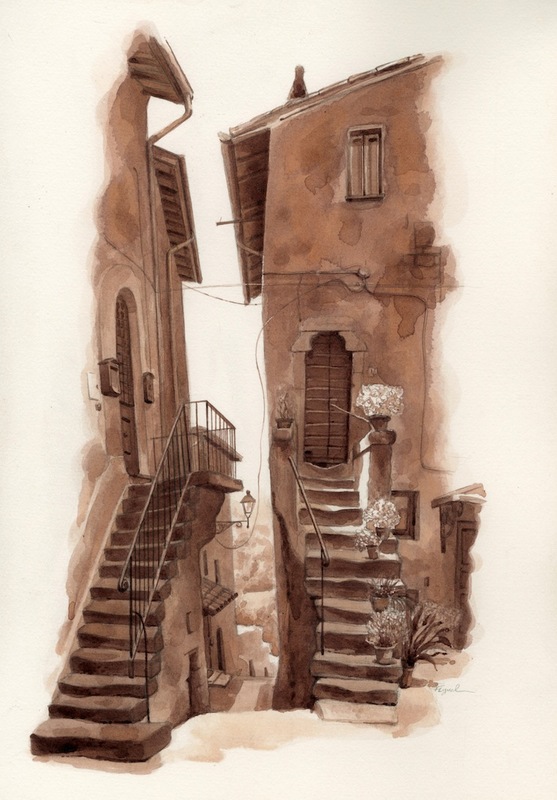 The other drawings (like, "Twin Staircases in Vitorchiano") were more personal, and thus, more new and interesting. That's why we see so much similarity in artists' styles, or more commonly, so much similarity of subjects. We sometimes draw what other artists draw, rather than what we individually would like to draw. I see it in my students all the time, and try to push them out of it. I push them to create something more personal. Bringing it back to my work - my students could feel the enthusiasm for my personal interests. They could also feel the compromise of my postcard-like works of famous places. Despite my skills of hand, my lack of heart tripped me up and dampening my enthusiasms. I compromised my muse. I need to watch out for that, because enthusiasm is the difference between a competent drawing and an interesting one. Sure, we can draw famous things - they're famous for a reason- but we should try to add something new to what is said about it - something personal, and thus, memorable. We can't just show things, we have to say things. **Postmodern thinkers are very cognizant of this stuff, but I'll not delve into those deep waters today, I'll soon be over my head.